Verizon Moving Away from the Droid Eris? Owners of the HTC Droid Eris have been seeing some dark predictions (specifically here, here, here, here, here, and here) these past few months as Verizon appears to phase it out for future phones like the Motorola Droid X and the Motorola Droid 2. So far the phone has been removed from Verizon’s website and there are hints that HTC will not be releasing Android 2.2, the newest version of the Android operating system, on it. But seeing as these are mostly rumors and leaks, it is hard to tell what is actually going to happen. How long should a phone stay on the market? 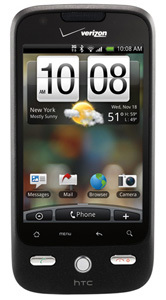 The Eris was released back in November 2009 and has been the affordable conterpart to the Motorola Droid for quite some time now. It may not have had the fastest processor or hardware, but it still handles the Android OS with relative ease. Whether or not these rumors are true, this Eris owner will not be trading in anytime soon. Let’s face it, the Locale app for Android was awesome. Being a product of MIT graduates, Locale is a simple and easy way to manage your Android phone’s settings through profiles triggered via either a GPS location or a specific time frame. And let me tell you, it was slick. When I was close to my apartment, my ringtone would change from a polite jingle to “Don’t Fear the Reaper” by Blue Oyster Cult. 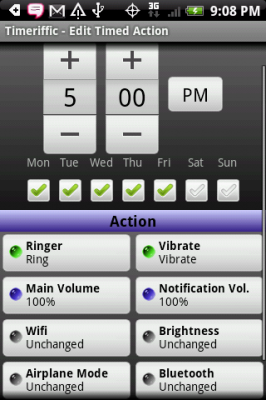 At school, my phone would automatically set itself to vibrate between the hours of 8 AM and 3 PM. I could even use specific contacts to trigger brightness settings, vibrate mode, and my Wifi module. I loved that app… that is, until they asked me for ten dollars to keep using it. Since then I have been tempted to drain my bank account to acquire Locale, but fortunately something else in the Market caught my eye. From the menu, profiles can be created based on personal situations that occur during the days of the week. Once configured, blocks of time can be added inside these profiles by pressing and holding them and selecting “Insert New Action.” These “Timed Actions” are the meat of the program, forcing settings to change based on what the day and time is. Here’s a simple example: let’s assume you are at work five days a week. 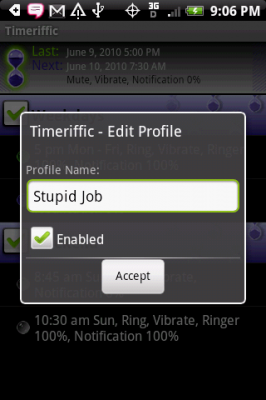 After creating the profile “Stupid Job,” you can then add a starting timed action for Monday through Friday at 8:00 AM to set your phone to “Vibrate” or “Mute.” Then, once the grueling day is done at 5:00 PM, you can create another timed action for the week to reverse the settings back to full volume. 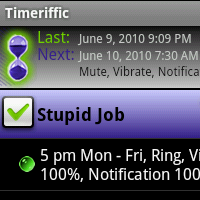 In the main interface, the Timeriffic system shows a green dot to tell what Timed Action is currently in session and a blue dot to tell which Timed Action will soon be triggered. Besides changing ring volume and vibrate, Timed Actions can also turn on and off features like Wifi, Airplane Mode, Bluetooth, and even the brightness of your phone. 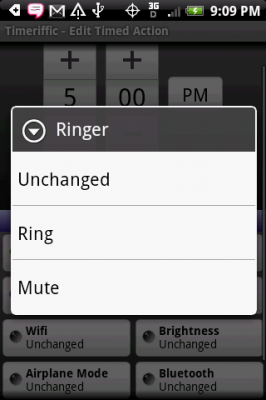 Sadly, changing the default ringtone is not an option at this time.